Our Opportunity – Why Now? In 1937, the federal government made the sale and consumption of marijuana essentially illegal. But in recent years, “weed” is now being decriminalized across the U.S. and Canada. Businesses and consumers are responding, and it has created one of the hottest growing trends in the market. In 2016, sales of legal marijuana in America generated $6.7 billion. The following year, sales of legal marijuana grew by 37% to reach $9.2 billion. And by 2018, we were at $10.4 billion. When you consider that sales of coffee in America are around $48 billion a year, three critical things jump to my investment mind. The first is that legal marijuana is a large industry; the second is that it’s also a rapidly-growing industry; and third, it has room to grow much, much larger. In fact, the legal marijuana business is set to grow so much over the next 10 years, I believe it will turn out to be one of the three biggest investment opportunities of your entire life, no matter when you were born. The opportunity in legal weed is much like the opportunity Internet stocks offered in 1994… or that Bitcoin offered in 2015. The legal marijuana business is set to grow many multiples of its current size – larger than the coffee business even. This incredible growth will send the value of the best legal marijuana businesses up 10X, 20X, even 50X over the coming years. The year of 2016 was a watershed for weed. Initiatives to either create or expand legal cannabis programs were on the ballot in nine states, and all but one was passed. The adult usage of marijuana was legalized in California, Nevada, Massachusetts and Maine, and medical marijuana programs were either created or expanded upon in Florida, North Dakota, Montana, and Arkansas. But 2017 was even bigger as the nation of Canada legalized marijuana for both medical and recreational use. Recreational marijuana is also now legal in 11 states, and 33 states allow medical use. You’ve probably heard the comparison between the weed industry and the alcohol industry of the 1920s. Prohibition suppressed a great deal of drinking in the United States. When the law was repealed, pent up demand was released, sales skyrocketed, and booze sellers grew rich. This isn’t just empty marketing hype. These forces have already driven marijuana stocks to large gains. In 2016, the North American Cannabis stock index was up 204%. In 2017, the index was up 90%. Here in 2019, the marijuana stocks I recommend in my Investment Opportunities newsletter gained an average of 52.8% in the first two months of the year. Given gains like that, some might be wondering if the best times are in the past for marijuana stocks. But they are not. A very strong tailwind will blow at this sector’s back for well over a decade. The estimates of where the marijuana industry will be in the coming years vary dramatically because there are a lot of unknowns. What states will move to legalize medical marijuana? Will the states that already have medical move to legalize it recreationally? How will it be accepted, and will it move to overtake cigarettes and alcohol? Most people hate uncertainty, but when it comes to investing it creates opportunity. The lack of certainty forces stocks to trade below their true valuations, and the marijuana sector is one such example. In 2017, North American legal marijuana sales came in around $10 billion – a 33% increase over 2016. With more states and Canada legalizing recreational marijuana, sales are expected to grow by another nearly 150% by 2021. Medical marijuana sales will continue to grow at an annual compound rate of 21% up until 2022. Recreational sales will climb to $24.1 billion by 2025. Let’s put the numbers into perspective. McDonald’s had sales of $8 billion in the U.S. in 2017. Based on the current numbers, it appears there will be more sales of legal marijuana than of Big Macs and Chicken Nuggets. That shows the scale of where the industry has gotten to and how big it can get when the federal government finally sees the light and legalizes marijuana from coast to coast. The industry offers a bigger impact than just money for the companies that grow and sell marijuana and related items. There are currently 125,000 to 160,000 people employed in the industry. That number is expected to grow to 340,000 by 2022. The economic impact of the marijuana industry was in the ball park of $28 to $34 billion in 2018 and should be above $100 billion by 2022. I believe marijuana could grab a lot of market share from cigarettes and alcohol. There is nobody debating the negative effects of smoking cigarettes, and the U.S. has a major issue with binge drinking among the younger generation. Both vices are on the downslope, and it is creating the perfect opportunity for marijuana to steal significant market share. If the marijuana industry can reach the $75 billion level that research firm Cowen has predicted by 2030, it will be just below the current sales of cigarettes ($77 billion) and encroaching on the $110 billion of beer sales. Let’s look at Canada specifically now that recreational marijuana became fully legal on October 17, 2018. In 2017, it was estimated that the country generated sales of $5.7 billion in marijuana. The caveat was that over 90% of it was on the black market. The big accounting firm Deloitte believes that with recreational marijuana legal in Canada, sales could boom to $8.7 billion per year. To put this into context, it is about the same amount that Canadians spend annually on wine. What most investors forget is that the marijuana business is not just about how much revenue is generated selling the plant. There are ancillary businesses, the “picks and shovels” as I call them. Deloitte believes that when the entire marijuana business is grouped together, the upside potential is for annual sales of $22.6 billion. Nearly three times the amount spent on wine! To show you that cannabis use in Canada is not a fad, here is a stat that will blow your mind. Cannabis consumption in Canada increased by 730 tonnes, or 1,678%, between 1961 and 2017. And that was when marijuana was illegal! These are incredible numbers. But don’t think the demand outlook for legal marijuana is limited to just North America. It’s much, much bigger than that. As I mentioned, sales of legal marijuana in North America were about $10 billion in 2017. Outside of North America, legal marijuana sales were a paltry $52 million in 2017, less than 1% of North American sales. In other words, there is huge room for growth here. The move by Canada and an increasing number of U.S. states will show the rest of the world how much money businesses and governments can generate from legal marijuana. This will be a huge driver in getting other countries to join the party. There is too much money in the marijuana industry for nations to sit back and watch their peers and enemies profit. The budget for the European government-subsidized healthcare systems is $1.3 trillion. Imagine if marijuana was able to get legal status for just medicinal purposes on the continent. It would be a giant market. Given this outlook, the roughly $10 billion global market for marijuana could grow to $57 billion by 2027, according to Arcview Market Research. There are even more aggressive forecasts out there. Ameri Research sees global marijuana sales hitting $63.5 billion by 2024. The basis of the prediction is that more countries will legalize marijuana at the recreational level. In the U.S., the marijuana industry remains illegal on the federal level. So, if you're a marijuana entrepreneur, it’s not possible for you to walk into the local bank and ask for a small business loan. Heck, you couldn't even open an account to deposit money! This has been a major hurdle for smaller companies that are in need of financing to grow operations. While the challenges remain, the industry has proven to be able to meet its financing needs via private investments. In the first 60 days of 2018, the industry brought in nearly $2 billion in new funding, up from $456 million in the same time frame in 2017. The average deal also rose, from $6.2 million in 2017 to $15.5 million in 2018. There are a few takeaways from the huge increase in money entering the industry. What strikes me is the actual number of $2 billion in only 60 days. That is proof that big money is coming into the marijuana sector. This alone starts to give the industry validity. It is also widely known that when big money starts to move into a new industry, the other sheep are not far behind. The other funds and venture capitalists do not want to miss out on a huge opportunity and will start to throw money at the marijuana stocks to join their peers. Not only are the marijuana companies getting better access to capital, the structure of the funding is moving in a positive direction. In the past, investors would be willing to loan the companies money via a debt offering, but now the majority is in the form of an equity investment. This trend is very telling and shows the confidence in the long-term outlook for the industry. Big money would rather be a part of the huge potential gains in the future via equity than a decent interest payment. And finally, all this leads to one thing for the marijuana industry – liquidity. When there is liquidity there is more opportunity to fuel growth. 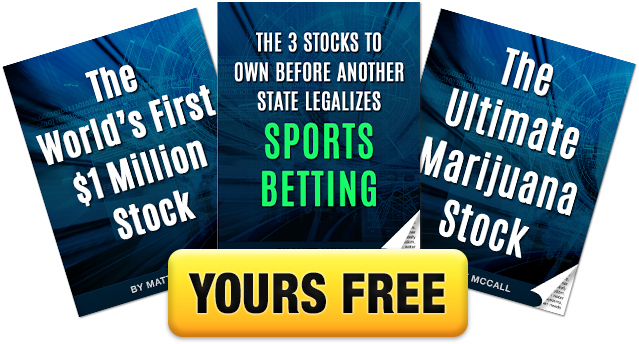 This removes a major barrier for industries in the early stages, especially one that is federally illegal, and it makes marijuana investing that much more legit. I already talked about the long-term outlook for the industry, where I see it going, how big it will become, and all the money that will be made in the right investments. The marijuana sector has always been news driven. That is not going to change any time soon. There has been no shortage of headlines in the past year, from legalization in Canada to the announcement from Canopy Growth (CGC), the largest publicly-traded marijuana company in the world, that Constellation Brands (STZ) was investing $4 billion into it. Constellation already had a 9.9% stake in Canopy from a prior investment in October 2017. The additional infusion of cash in 2018 resulted in Constellation owning 38% of Canopy. If you think about the over $4 billion Constellation has invested in Canopy, it is significant when compared to the market cap of $16 billion. This is huge, and it means great things not just for Canopy but for the sector as a whole. It’s a ringing endorsement for the anticipated growth of cannabis both in Canada and the United States. The midterm elections last November marked a shift in Washington, D.C. The first big development was the Democrats taking control of the House. Then, President Donald Trump fired Attorney General Jeff Sessions the next day. Sessions was a staunch opponent of legal marijuana, and his views were always a cloud hanging over the future of the industry as well as marijuana-related stocks. But the departure of another Sessions was even more significant. Congressman Pete Sessions from Texas lost his reelection bid and his appointment as chair of the House Rules Committee. For years, the former Congressman blocked any reform at the federal level by denying votes on anything and everything related to marijuana. To grasp the importance of the political shift, just look at the breakdown of House members. A total of 68% are from districts that have legalized marijuana either medically or recreationally. In other words, once the bills make it to the committee, they are almost guaranteed to pass. The news was even more positive at the state level. Twelve governors won election running on a pro-marijuana legalization. From now until Election Day in November of 2020, the media will be talking about the next election. This will be the first presidential election in history in which there will be a focus on candidates’ views of marijuana and legalization. With two-thirds of adults in the country in favor of legalization, it is becoming more politically damaging to not support legalization. An eye-opening 75% of Democrats support legalization, and odds are that all candidates from that party will side with the majority of their voters. Even more astounding is that for the first time, over half (53%) of Republicans now back legalization of marijuana. We’ll also likely see more headlines concerning big names moving into the sector. One of the conferences I attended in 2018 was the O’Cannabiz Cannabis Conference in Toronto. All of the big names in the industry were there. One interesting takeaway is the expectation for more mergers and acquisitions (M&A) activity. A few reputable names in the cannabis industry mentioned to me that tobacco, alcohol, and drug companies were all sniffing around, so I’m sure we’ll see more of them team up in the future. Earlier this year, I attended the Benzinga Cannabis Conference in Miami. I’ve been following the huge opportunities in marijuana companies for nearly a decade, but when I left the conference my enthusiasm for the long-term wealth-building potential was at a new level. The buzz there centered on another huge potential catalyst called the STATES Act. STATES is short for Strengthening the Tenth Amendment Through Entrusting States. The Act is a bipartisan bill put together by Senators Cory Gardner (R-CO) and Elizabeth Warren (D-MA). The legislation was introduced last June. If passed, it would amend the Controlled Substances Act. This is big because the federal prohibition would be eliminated in states that legalize marijuana. As long as residents follow their state’s laws on marijuana, the federal government would not be able to intervene. The odds of the bill getting passed this year are very high. It would make it even easier for more states to legalize marijuana. More importantly, it would be the first major step to federal legalization… and that’s when the opportunity opens up all the way. These catalysts can help boost stock prices for years into the future. That’s why I have my subscribers investing early. We’ve already begun building our positions in this space, and as the exciting catalysts continue to play out I look forward to adding more. Of course, with above-average potential comes above-average risk, so the key is to focus our investments in industry leaders that meet our strict criteria and stay away from more speculative plays. In this report, I’ll share three names I like right now that fit that bill. CannTrust Holdings (CNTTF) is a federally regulated licensed provider of medical cannabis under Health Canada. With more than 40 years of pharmacy and healthcare experience, it is one of the most trusted brands of cannabis in the Canadian market. CannTrust is also focused on research and innovation. In fact, it was granted a Section 9 License by Health Canada that allows it to expand its product development and research to include pharmaceuticals. This makes it easier for its 46,000+ patients to use medical marijuana. But CannTrust’s reach doesn’t stop in Canada. Its exclusive pharmaceutical partner Apotex provides it distribution to 115 countries around the world, and it also has partnerships and/or licenses in Denmark, Australia, Germany, and the Netherlands. Looking ahead, CannTrust is positioned well to expand into Canada’s recreational cannabis market now that it is officially legal. It has plans to launch three new brands – Liiv, Xscape and Synr.g – and it is also ready for the edible market with developed formulations and patents in place for beverage categories. While the company’s focus will remain on catering to its medical cannabis customers, it is well positioned for growth as the market expands and will benefit greatly from its move into recreational uses. This is a very exciting opportunity to play both current and future trends. 22nd Century Group (XXII) is a $246 million company based in New York that focuses on plant biotechnology. Its innovative product allows a tobacco plant to grow with 97% less nicotine than a regular plant. But what’s really exciting here is that it is also working on a marijuana plant that does not contain THC (the element that makes people high). That’s where Botanical Genetics, a wholly-owned subsidiary of 22nd Century Group, comes in. Botanical Genetics is a plant biotechnology company that creates proprietary cannabis strains for use in new medicines and agricultural crops. It has partnerships with leading Canadian cannabis research company Anandia Labs and major U.S. universities that allow it to legally conduct a full spectrum of marijuana research. It also possesses exclusive cannabinoid biosynthesis licenses that give the company an edge in the development of medical cannabis. Circling back to the parent company, 22nd Century Group was founded in 1998 as a way to provide funding for a research and development collaboration with North Carolina State University on nicotine biosynthesis in the tobacco plant. This research ultimately led to the company’s proprietary technology that allows it to produce cigarettes with significantly less nicotine. The company was incorporated in 2005 and went public in January 2011, the same year it also entered into a research and development agreement with the University of Virginia and introduced two super-premium cigarette brands to the U.S. market. This early-stage plant biotech company is still losing money, but if the FDA approves the company's low-nicotine cigarette, it would be a major boost to the stock. There is also the potential the government will require all tobacco to be low-nicotine in the future. This remains a high-risk, high-reward play. Also significant, 22nd Century Group was added to the Russell 2000, Russell 3000, and Russell Global Indexes in June 2018. As its products develop, it is important that a company hasenough money to proceed, and 22nd Century Group meets that requirement. That puts this small biotech in position to be a game-changer in both the tobacco and marijuana industries over the long term. ETFMG Alternative Harvest ETF (MJ) is the United States’ first marijuana ETF, and as a result it’s in an unprecedented position to benefit from this booming trend. The ETF is made up of stocks primarily from the United States (26%) and Canada (61%). The companies focus on the healthcare, consumer, and materials sectors within the cannabis industry, which means the top holdings are direct plays on the primary trend. One of its largest holdings is Canopy Growth (CGC). Much of the ETF's upward trajectory has been a result of liquor producers getting in on the trend as they see the writing on the wall, so the news of Constellation Brand’s (STZ) increased stake in Canopy was a huge boon for ETFMG Alternative Harvest. Another of the ETF's top holdings that has benefited from the partnership between alcohol companies and cannabis producers is Cronos Group (CRON). Word that Smirnoff and Johnnie Walker maker Diageo (DEO) was in talks with at least three Canadian pot companies about teaming up sent Cronos soaring – and in turn, ETFMG Alternative Harvest. That’s the beauty of playing this trend with an ETF. It gives you exposure to some of the biggest beneficiaries while also providing a balance with niche names. That way, both sector news and individual company news can help your position. ETFMG Alternative Harvest trades about 900,000 shares per day and the spread between the bid and ask prices is a few pennies, which is good. Plus, with close to $1.1 billion in assets under management, the ETF has solid liquidity. Expenses are also reasonable at 0.75%. That’s fairly standard for a niche fund and an acceptable level in my book. There are so many upside factors to the overall marijuana trend, and an ETF is an exciting way to give your portfolio exposure to all of them. If you’re looking to get invested in this area, I recommend considering ETFMG Alternative Harvest ETF as a smart starting point. Consider the power of being the first to know how a new technology called “fracking” was allowing American oil firms to tap vast new deposits. Investors who got this knowledge first made life-changing 8,400% gains in fracking company Kodiak Oil & Gas…. 3,200% in Bringham Exploration… and 5,800% in XTO Energy. Or take the power of being among the first to know in 1992 how a new development called “the Internet” was set to change the way we work and live. Investors with access to this knowledge made over 9,000% in software maker Microsoft… and more than 10,000% in Internet plumbing maker Cisco. A 9,000% gain turns an investment of $10,000 into $910,000. That’s an investment return that can allow you to afford virtually any kind of lifestyle you like. You can buy boats, sports cars, vacations, and homes with that kind of money… or simply never work again. Wall Street won’t tell you this, but by the time the general public hears about a major investment trend, the big money has already been made… by those who got there FIRST. The people who buy stocks once a big trend goes “mainstream” often buy at the top and suffer big losses. The power of being first is why I’ve dedicated my career to getting investors into the world’s biggest, most revolutionary trends BEFORE anyone else. Take the people who got to the electric car trend first in 2012. 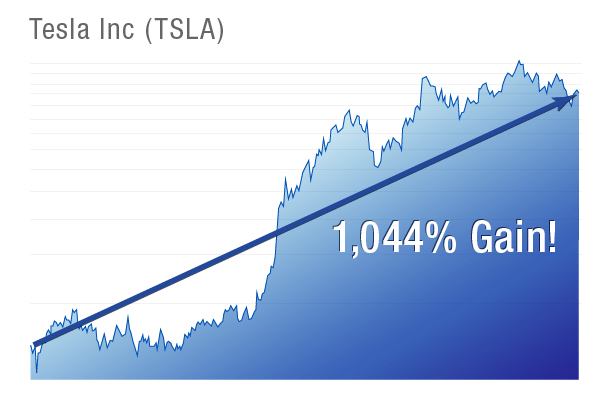 Driven by early sales and the promise of pollution-free electric cars, Tesla shares climbed from $25 to $283 per share in less than three years… a 1,044% gain. I know gains of 1,000%… 5,000%… and 9,000% sound outlandish. But those are exactly the kind of gains earned by investors who get to big, world-changing trends first. As a reader of Matt McCall’s Investment Opportunities, you’ll hear all about the next trends poised to hand investors 1,000%+ gains… and you’ll get specific and actionable recommendations for taking advantage of them. Even better, you’ll be the first one in your neighborhood… the first one in your company… among the first people in the world to know about them. Seventeen years ago, I was a high-powered broker for financial giant Charles Schwab. It didn’t feel right to me. I wanted to be someone who helps people make money for themselves… not someone who makes money from investors… which I find disgusting. So, I walked away from a promising career in 2002 to do what really inspires me: helping individual investors just like you reach financial independence. I wanted to reach folks who live on Main Street — not Wall Street — just like my family and my friends… the very backbone of America. That’s why I became chief technical analyst and co-host of the nationally syndicated radio show, Winning on Wall Street. I did this to get my message out, and help educate as many investors as possible. And that’s why I founded Penn Financial Group, a registered investment advisory. I wrote two investment books, with my latest — The Next Great Bull Market — a top seller for over two years. I’ve made over 1,000 television appearances, on networks like CNBC, Fox News, and Bloomberg TV… eventually becoming a nightly co-host on Fox Business. You may have seen my articles in The Wall Street Journal, Business Week, and Investor’s Business Daily, to name a few. I’m not saying any of this to brag… only to show you that I know what I’m doing. None of those credentials matter much if you don’t make people money. You’ve probably heard how the technology of “fracking” has allowed oil producers to tap vast amounts of new oil and gas in America. Fracking has allowed America to drastically reduce its reliance on foreign energy sources. America is producing so much oil and natural gas that it’s beginning to export natural gas to energy-hungry Asian markets. My readers and I got to this story first and bought shares of Liquefied Natural Gas Limited — a company that builds the expensive facilities the U.S needs to export its new energy bounty. We made 611% on the position in less than a year. That kind of gain turns a modest investment of $10,000 into $71,100, a cash profit of $61,100. What would you do with an extra $61,000 this year? The recent cryptocurrency boom is one of the biggest wealth-creation events in modern history. My readers and I were right there profiting from it. In 2017, I recommended Bitcoin Services, a small company that mines the popular cryptocurrency Bitcoin. We made 324% on the position… in less than two months! The growth of unmanned planes that can fly themselves (or be flown by an operator on the ground) is growing by leaps and bounds. Drones are such big assets to the military because they keep human personnel out of harm’s way. My readers and I were on to this boom very early. In 2013, we bought shares of Elbit Systems, one of the world’s leading drone makers. As of early 2018, we’d more than tripled our money. “Thank you, Matt., Because of your EXCELLENT Newsletter, my sister and I were able to keep our business intact during this down trend in the economy… and keep several people employed. Things are looking better now & I don’t see how we could have gotten to this point without you." Investment Opportunities costs $99 for one full year. While we typically stick to U.S.-listed stocks, we know it’s a big world out there with lots of opportunities. We’ll invest in stocks, commodities, real estate, bonds, gold, and other assets. But all of our recommendations are easily purchased in regular online brokerage accounts. To give you an idea of what to expect, I’m currently focusing most of my time and energy on mega-trends like blockchain, the legalization of marijuana, Artificial Intelligence, gene editing, the Internet of Things, and electric vehicles. 12 Monthly Issues of Matt McCall’s Investment Opportunities: Every month, I’ll send you a full issue that details what I believe are the world’s biggest investment opportunities. Inside our issues, you’ll find our latest investment recommendations, our current portfolio… expert insight from my large list of contacts… and insight you won’t find anywhere else. Special Readers-Only Reports: In these in-depth “situational” reports, I’ll devote 12–36 pages to world-changing business and technological trends that are set to deliver triple-digit gains to investors. Urgent position updates: Although we follow a monthly publishing schedule, I’ll send you timely updates if something major is happening with one of our positions. The Investment Opportunities Owner’s Manual: This short, easy-to-read manual explains my approach to the market… how I find opportunities… the right way to buy and sell stocks… and lots of other key ideas that will help you make big returns without taking big risks. I’m confident you can see that $99 is a great bargain. I think that’s an incredible deal for what you get. And the best part is, my publisher and I are not asking you to commit to anything. We’d like you to take the next 30 days to decide whether or not you want to keep your subscription. That should give you plenty of time to review my work. If you decide Investment Opportunities isn’t right for you, just give us a call. We’ll be happy to issue you a full refund. You’ll risk nothing. © 2018 InvestorPlace Media, LLC. All rights reserved.